Shkodran Mustafi – give the man a break! This post was prompted by yet more whingeing from Arsenal fans about Mustafi after a failed block in a friendly in Dubai, for heaven’s sake. Shkodran Mustafi signed for Arsenal from Valencia in August 2016 for a reputed fee of £35m. In his first two seasons under Arsene Wenger he played 26 and 27 games respectively, missing a few games in both with hamstring and thigh muscle problems. For quite a while now, he has been the whipping boy of the Arsenal fans and many were hoping to see the back of him at the end of last season. With the long-term injury to Kos, this never looked likely to happen. Under Unai Emery, Sokratis had been bought from Dortmund in the summer and Rob Holding chosen to fight for a first team place in preference to the unlucky Calum Chambers, who was sent out on loan to progress his playing time. Almost undetected, Herr Mustafi has become an invaluable part of the Arsenal squad. Unai Emery chose him to be the regular partner of Sokratis at the start of the season. When Papa was injured in October, Rob Holding stepped into the breach to partner Shkodran and quickly looked to be maturing into the role very nicely indeed. Rob’s injury in the away game at the Old Cowshed has been absorbed by the gradual return of Captain Koscielny and by Papa establishing himself as a no-nonsense old school defender who can adjust to the rigours of Premier League football. Throughout these upheavals, and aside from a hamstring in December which kept him out for 7 games, Mustafi has been a constant in the Arsenal defence. Admittedly part of that has been down to the shift to a back three to allow Sead Kolasinac into his favoured left wing back position, but even so, Shkodran has never baulked at his opportunities to pull on the red and white (or pistachio!) shirt of the mighty Gunners. His 24 appearances are testament to that. So far he has played 1987 minutes of Arsenal League season, the 5th highest. Can he really be as terrible as everyone makes out? Let’s take a look at some of his other stats. Shkodran makes on average 3.4 aerial duels per game which is the highest for any Arsenal player. He also tops Interceptions at 1.9 p.g. and Clearances 5.3 p.g. These are not the stats of the completely incompetent player we see described all over the Arsenal blogosphere. How about his passing? Is it the accident waiting to happen constantly mentioned on twitter. Well, it’s surprising to find out that he’s third on the list of Arsenal passers at 1319 in terms of volume, a hundred less than 2nd placed Torreira. Yes, a fair few of those have been sideways or back to the keeper as the team attempts to implement Unai’s ‘playing out from the back’ policy, but his pass accuracy is 83% and according to the official stats he hasn’t made any errors directly leading to a goal. His tackles made and fouls conceded per game are both 4th in the list and he sits on 6 yellows, the same as Torreira, 2 behind Xhaka and 3 behind our imperturbable Greek. Have we paid for his perceived tendency to launch himself into reckless challenges? It appears not quite as much as his reputation would have us believe. Yes, he may end up on his backside on occasion and the odd pass may go astray but all players make mistakes. The odd lapse shouldn’t discount the other 98% of a player’s overall performance. Can anyone remember when Koscielny was coming under constant criticism for not being good enough in his first couple of seasons? Shkodran played in one of our best performances at home to Liverpool, was subbed on 70 minutes in the thrilling home victory against the spuds with Arsenal pushing for the win and he also scored the first goal away at Man U. Yes, our first choice centre back pairing has become Kos and Papa in a back four but don’t rule out a few more starts for Mr Mustafi in the run-in – especially if we go to a back 5 to make room for the Bosnian battering ram. Here’s Mustafi’s bullet header from the away game in Cardiff back in early September. This season Unai has relied on the German Albanian enough for him to have started 80% of our League games. In a reasonably successful season so far for the Club, can we really say Mustafi hasn’t earnt his money as a decent squad player? I suppose what I’m getting at is, regardless of what may or may not happen in the summer, please cut poor old Shkodran some slack. He may well yet play a crucial part in this season’s finale as we seek a CL place, be it either through the League, or via the Europa Cup. This entry was posted on Thursday, March 28th, 2019 at 6:41 am and is filed under Uncategorized. You can follow any responses to this entry through the RSS 2.0 feed. You can leave a response, or trackback from your own site. 26 Responses to Shkodran Mustafi – give the man a break! He is a decent squad player. Belli as a marmite player? I was careful to admit that I was likely to be ploughing a lonely furrow with regard to my views on Belli Button, and I also used the determiner – ‘my’ marmite – which was intended to show that I was not claiming it was a view held by anyone else. Just an opinion. Hope that’s OK? A fine and well argued defence of the chap. I tend to agree with Njamio. The Kane one doesn’t count because he was offside before. Mis-controlling a pass – how dare he! Oh yeah, Holding’s out for another 6 months if you haven’t already noticed. Just seen on the News a 9′ alligator strolling leisurely across a green and scaring the sugars out of the golfers no doubt. Some years ago. while playing golf in Florida, I hit a ball onto the green within 5′ of a sleeping alligator — no where near 9′, more like 5 or 6′. It was, for me, a great shot onto the green, and I was reluctant to just walk away. I tiptoed over to the ball (and the alligator) and lined up the put and got a birdie. Then “Hold it”, came the call, “we need a photo of this” and I bravely smiled while thinking this is crazy. ‘Back a bit’, and, “a bit more” — and nerve failing I ran. A guy in a buggy raced up, and yelled “you are a fool – get off the course” and he kicked me out of the club. He was right to do so — that thing moved like lightning when he yelled, and luckily ran straight into the water. Do the same people who blub every time he does a bad, also chuck everything out of the pram every time Laca misses, or a Mhki pass goes wonky? He wears the shirt with pride and gives his all every game; as supporters we should stand behind him. Fab, salmon-against-the-stream post, Chas, and well done for putting some of his key (and pretty impressive) performance stats in. 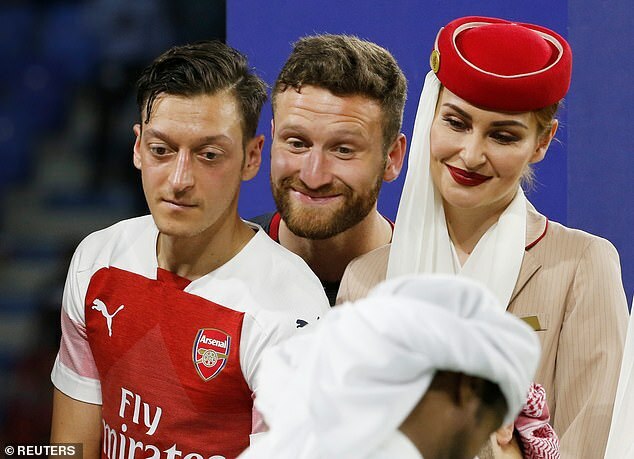 For me, Mustafi is a bit of a chancer: he plays with high energy and commitment and some games this pays off and some games it leads to vital mistakes. His positioning is often below par and he does not bring the calm to the game of a Sokratis or even a Holding, but his pure defence stats are good – simple as that. I reckon he functions better in a back three with calm Sok in the middle and Koz on the other side and, like others have said, he is a good squad player to have. Finally, I have always felt that he would make a good DM and can see him as back up to Torreira going forward. His passing is good, he is strong running forward with the ball, has high energy and is good in the air and on the ground – and a mistake in front of the back four (three) would not always be costly. I tend to agree with BR, agreeing with Njamio. It is not contradictory to the answer I gave to the question you put near the end of your Post, which is, yes, he is a squad player. The supplementary question, perhaps, is — are squad players good enough for Arsenal? Not for me, but then we get back into the ‘funding’ equation. Mind, if we did spend £35m on buying skhodran, was that money well spent? No. Your comment has put a view of Mustafi that better explains my own view. In fairness on occasion, he has made me shout at the screen because he has messed up — shortly after, he has headed a brilliant goal, and had me cheering. TA approach is closest to my view. I wonder at the quality of his football brain/decision-making skills. Impetuosity is not very helpful in the modern game and especially if it then results in him blaming others for THEIR positioning. And, on another controversial figure! Granit left the field in mid- week with an abductor muscle problem – usually three or four weeks plus if serious. I’ve enjoyed moaning about Mustafi – now you’ve gone and spoiled my enjoyment. But I must (reluctantly) agree that the criticism is a tad over the top. But I loved it all — the views from Sky Rail, or getting the old railroad from Cairns to Kuranda, getting a trip win a Duck, the waterfalls, the Barron River, the Barron Gorge, Trinity Bay – superb. My only complaint is that I still did not see everything and I missed far more than I had time for. But — trying to show off with the Gator on the Green in Florida was pretty stupid and not recommended, altho it was not a saltwater croc like you get in Queensland. Years ago when I was fooling around during a trip to see relatives in Oahu, I went back to Waimea Bay on the North Shore where I kidded myself I wasn’t a bad surfer (I was) and my cousins who surfed everyday were fantastic. One day they told me to get out, now — and I thought they were kidding. I had gone out too far for my skill level, and was getting in trouble with waves I could not deal with. They were not kidding — I learned later on TV News that a tourist had been gutted by a tiger shark just along the coast. Yikes. I read your comment on Bellerin yesterday with the humour that I am sure was intended. it’s still funny that Hector could be a marmite player. Onto today’s post, firstly, time and trouble has been put into that post and I thank you for doing so to give people like me something relating to Arsenal to read in these dull days. I think what went wrong was that if you cast your mind back we were looking pretty good at the back before Holding got injured. When he was clattered in the United game, things started to drop off I think our unbeaten run came to an end shortly after. The finger of blame moved towards Mustafi, there was no doubt that he was dropping a clanger or two and I think people feared that things would carry on as they were until the end of the season. Calls for the purchase of a new CB rang out as it looked initially like Koscielny was not going to be able to make the grade and again Mustafi caught the flack. Now, however, it is clear that all our eggs are no longer in the Mustafi basket; Big Sok and Koscielny are the first two CBs of choice. All of which takes the pressure off of Skod making people realise that a player of his experience and calibre is, as you say above, an extremely important asset to have in any squad. It’s funny how we have gone from crying out for the club to release the purse strings and buy a new CB, shortly after Holdings injury, to realising that we probably have too many and it is unlikely that new purchases will be made in that area.